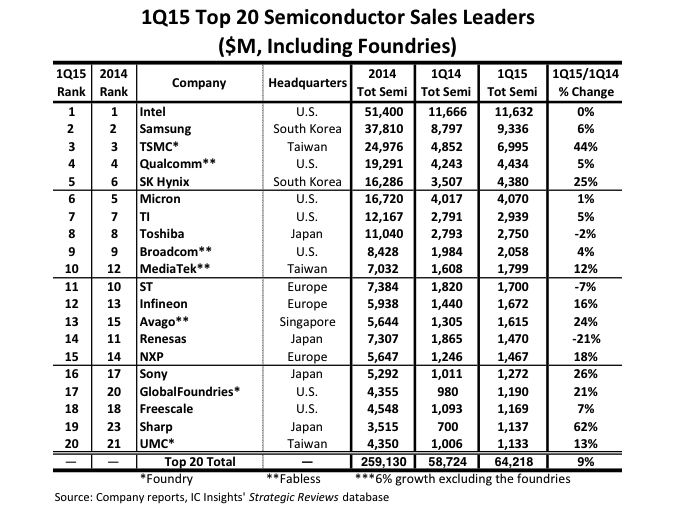 The rankings for the top 20 semiconductor sales for Q1 2015 have been released. Intel and Samsung are in 1st and 2nd place respectively and not surprisingly! The other companies within the top 20 are also unsurprising with other big names such as Qualcomm, TI and Avago all entering the top 20. All of the top 20 have made a huge amount of money in the first quarter, especially TSMC with their sales from 1Q14 to 1Q15 increasing a gigantic 44%! 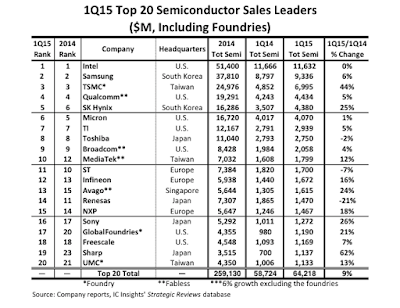 Intel's sales have remained flat but they remain on top and ahead of Samsung by $2,296M. The majority of the companies are US based with 7 of them hailing from North America. Of the rest 4 are in Japan, 3 in Taiwan, 3 in Europe, 2 in South Korea and 1 in Singapore. There is quite broad mixture of locations showing that not one country is dominating completely. With all the mergers and acquisitions in the pipeline such as NXP & Freescale and Microchip & Micrel, and no doubt there will be many other M&As occurring which we have no clue about yet, this ranking is likely to change considerably in the future.